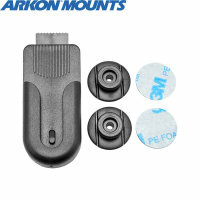 Keep your smartphone handy at all times with the Arkon Universal Smartphone Belt Clip Holder. Providing a simple attachment system for your device, this belt clip is both portable and sturdy, allowing for a comfortable but secure fit to any belt. The Arkon Universal Smartphone Belt Clip Holder has been designed to be as sturdy as possible featuring a tough polycarbonate clip that will simply attach onto most belts and securely hold your smartphone in place. The included locking button is backed with super adhesive 3M tape so attaching it to your device or phone case couldn't be any easier. Once applied, the locking button simply snaps into the belt clip and your device is held securely in place thanks to the long lasting durability of the 3M tape. Attaching and detaching your phone from the Arkon belt clip is effortless thanks to a spring-loaded sliding feature. This sliding attachment allows you to quickly holster your phone or retrieve it so you can rapidly have your phone at the ready to make phone calls, send text messages and take photographs, meaning you'll never miss a moment. 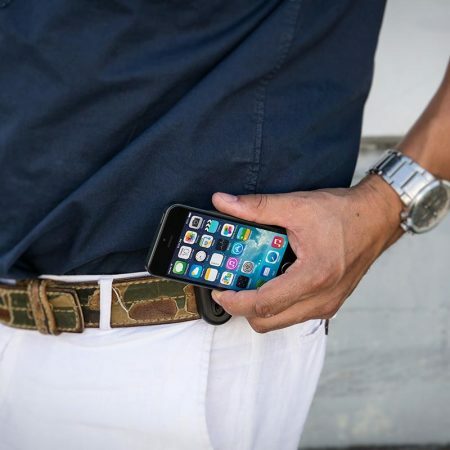 The spring-loaded belt clip also allows your phone to swivel, so you can get it into a position that is comfortable for you. The Arkon belt clip has a compact profile, so it is easy to carry your smartphone with you without the belt clip getting in the way. The lack of bulk also allows for complete comfort when attached to a belt. The Arkon Universal Belt Clip Holder will work with all smartphones and most cases, so you can keep your precious device protected at all times while you carry it around in style.